If video games and Breaking Bad have taught us anything, it’s that sometimes it’s fun to be the bad guy. That time-honored rule holds true with the first glimpse at Warner Bros.’ Batman: Arkham Origins‘ Deathstroke DLC gameplay, which puts players in the shoes of DC Comics’ legendary mercenary and assassin. The Deathstroke DLC is available by pre-ordering Origins, which releases on PlayStation 3, Xbox 360 and Wii U on Oct. 25. 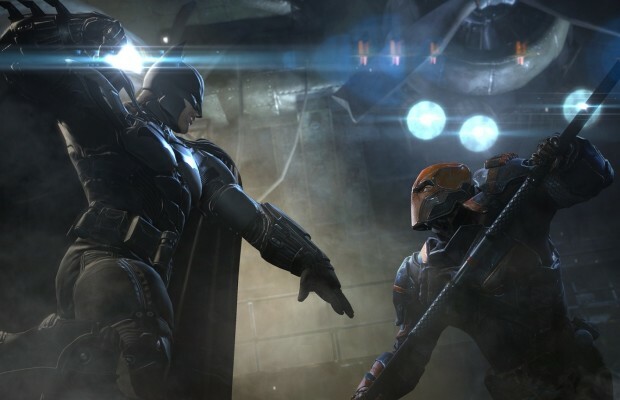 The game serves as a prequel to previous Arkham games, seeing a young Batman pursued by deadly assassins – including Deathstroke – on Christmas Eve on the orders of crime boss Black Mask. Slade “Deathstroke the Terminator” Wilson has terrorized the DC Universe since his first appearance in 1980’s The New Teen Titans #2 by Marv Wolfman and George Perez. The villain and sometimes-antihero became prominent as an antagonist for the teen hero group, though he’s often gone up against the Justice League and other DC characters, including Batman and his allies. The character’s even starred in comics of his own, first with a series that ran 60 issues from 1991-96, and another series that ran 20 issues which ended in July. Bat-fanatics, are you excited to get your hands on Deathstroke when Origins hits next month? Let us know in the comments.